The eerie sounds of pipes and drums reverberate through ancient castles and the midnight silence of old English churches is often broken by booming pipe organs played by unseen hands. The U.S. also has its share of phantom organists and there is a smattering of ghostly harpists, pianists and buglers, but it is the violin – or fiddle – that seems to spawn the most supernatural activity in our fair country, primarily, but not exclusively, in the foothills of Appalachia and rural South. As for the difference between a violin and fiddle, someone once said, “It’s a fiddle when you want to buy it and a violin when you want to sell it!” Violins are associated with orchestras and classical music; fiddles conjure images of hillbilly clog dancers. But regardless of the purpose for which it is used, many violinists and fiddlers refuse to part with their instruments – even in death. The Library’s Phantom Violinist. 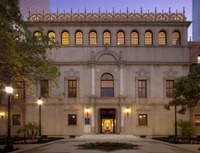 The Julia Ideson Building (above) at 500 McKinney Street houses the Texas Room and archives of the Houston Pubic Library. The Spanish Renaissance Revival-style building, quite frankly, looks haunted, so the fact there is a resident ghost comes as no surprise. “Mr. Cramer,” an elderly janitor, was already working for the library when the new building was dedicated in 1926 and took up residence in a tiny basement room. Although considered somewhat “slow,” Cramer played the violin flawlessly. He could not read music, but if he heard a tune, the old gentleman could play it note-for-note as though he had practiced for weeks. Once he finished his daily duties, Mr. Cramer walked the halls entertaining library patrons with the most difficult pieces from Chopin, Mozart, Beethoven and other notable composers. There were some who claimed Cramer could play Tchaikovsky’s Violin Concerto as well as any Julliard-trained violinist. Cramer was a dedicated and reliable employee and during his many years of service had always been standing ready to open the staff entrance as other library employees arrived. So, that morning in 1936 when the assistant librarian found the door locked, she knew something was wrong. 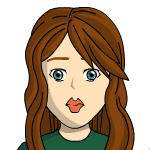 She hurried downstairs and after knocking, entered the sparsely furnished, but neat, little room and discovered the body of the elderly janitor. He had died peacefully in his sleep. Everyone was saddened; the old man had been a favorite with library staff and patrons alike and they would all miss his concerts. For more than 80 years, employees and patrons of the Houston Public Library have reported hearing the spectral violinist. But no one is frightened. They are just happy that in death, Mr. Cramer is doing what he most enjoyed in life – playing the violin. Serenade at Lindenwald. Lindenwald, an 18th-century Federalist mansion in Kinderhook, New York, is haunted by a phantom violinist and at one time, perhaps a haunted violin, as well. Located in an area rich in ghost-lore, it was while he was staying at Lindenwald that Washington Irving penned his masterpiece, The Legend of Sleep Hollow. In 1839, the property was purchased as a retirement home by Martin Van Buren, eighth president of the United States. He made many improvements to the house, including the addition of the four-story brick tower – the dwelling’s most identifiable feature. Van Buren lived in the home until his death in 1862. Following Van Buren’s death, Lindenwald changed hands many times. Prior to its purchase by the National Park Service in the 1970s, the property had served as a private residence, tea house, nursing home and an antiques shop. In the 1940s, a former concert violinist was one of the residents of the nursing home operating in the building at the time. Because her hands were crippled by arthritis, the old lady could no longer play as she did when young, but on days when her fingers were more flexible, she would sometimes take her violin from its case and classical melodies drifted down from her second-floor bedroom. After the nursing home closed, a family by the name of Campbell purchased the house in the 1960s and maintained an antiques shop on the premises. An old violin that had obviously seen better days had been left behind by someone and Campbell cleaned and polished the thing as best he could, laid it inside a locked glass case and placed a $25.00 price tag on it. But some mornings when he came into the shop, he would notice the violin seemed to be in a slightly different position and when the light struck it from a particular angle, the thing looked much better. As the days passed, the cracks in the polish appeared less noticeable and the beautiful contours of the wood more evident. And if this wasn’t strange enough, one of his employees swore she occasionally heard what sounded like violin music. “Yes, ma’am, I believe it is,” Campbell answered. But, unfortunately for the antiques dealer, this did not deter the woman and she and her son left with the resplendent violin. But selling the violin did not stop the second floor concerts. To this day, visitors to Lindenwald (above), now the Martin Van Buren National Historic Site, sometimes question tour guides about the lovely violin music emanating from within a closed room on the second floor. Fiddlers Bridge. “Fiddles” were the instruments of farm folk and mountain people and because they were often played at dances, barbecues and other social events that involved frolicking and the consumption of alcohol, some religious sects condemned them as tools of the devil. Appalachian folklore is replete with ghostly tales in which fiddles play a major rôle. Usually, a parent forbids a child to bring the “devil’s instrument” into the house or learn to play it. Invariably, the youngster disobeys and his actions result in disaster or death. Years later, on cool, clear nights, when the moon is full, lively tunes are heard coming from some old house or hollow where a child defied his parents by taking up the fiddle. But not all phantom fiddlers are the result of parental defiance or devilish intervention. For example, the phantom fiddler of Scott’s Run Bridge (also known as “Fiddlers Bridge”) south of St. Georges, Delaware, met his death at the hands of a group of young ruffians. As he aged, Ebenezer became more withdrawn and by the time he reached his 70s, many considered him downright strange. On warm evenings, the now stooped old man, would walk down to Scott’s Run and sit on the railings of the bridge fiddling the night away. Elderly eccentrics are often victims of teenage taunting and Ebenezer was no exception. Early one evening, several boys were tormenting the old fiddler and during the horseplay, one of the youths gave the curmudgeon a slight shove and he toppled over the railing. The stream, swollen from spring rains, was deep and swift and the boys watched helplessly as the frail old man was pulled under, still clutching his beloved fiddle. A few weeks after the incident, a child crossing the bridge with a group of friends stopped, tossed a penny into the water and made a wish. When the penny hit the surface, they heard a few notes of what sounded like fiddle music. Other children threw pennies into the stream with the same result. Word of the haunted bridge spread and people traveled many miles, hoping to hear the phantom fiddler. One late October night in the early 20th century, a lady who lived nearby gave a party and after dinner, led her guests outside. Under a bright moon, they made their way to the bridge. One tossed a coin into the still, black stream and, sure enough, they were rewarded with the distinct music of a fiddle. Another followed suit and, before long, a veritable concert arose from the dark, eerie waters of Scott’s Run. The road leading to Scott’s Run is now a modern four-lane highway and the old wooden bridge from which Ebenezer fell more than a hundred years ago has been replaced by a soaring, modern structure, but it is still called Fiddlers Bridge. Fiddler’s Rock. Another location named for a phantom fiddler is “Fiddler’s Rock” near the top of Stone Mountain in Johnson County, Tennessee. It seems a fiddler by the name of Martin Stone heard about Indian snake charmers and wondered if he could charm rattlesnakes in the same manner. One day, he climbed the mountain where he knew there was a proliferation of rattlers, sat down on a rock and began fiddling. Sure enough, the snakes began slithering from between the crevices in the stones, charmed by the music. After that, every few days, Stone hiked up the mountain trail with his fiddle in one hand and his shotgun in the other. He would play for the snakes and shoot a few once the concert was over. There were always several rattlesnake skins drying on the side of his barn. Tourists paid high prices for belts and other items made from snake skin and many fiddlers purchased snake rattles to place inside their instruments, believing – as did Stone himself – that it improved the tone. Fiddling for the snakes was proving profitable and Stone couldn’t resist bragging about his success. Growing evermore cocky, Stone decided he would try charming the snakes at night. His buddies warned him not to climb the mountain after dark, arguing that if the snakes came out, he wouldn’t be able to see them. Stone just laughed, “I’m wearing knee-high boots. There’s not a snake alive that can bite through this leather!” he declared, slapping his bow against the side of his right boot for emphasis. So one warm Indian summer afternoon, as a blood-red sun slowly disappeared behind the far off western peaks, Stone hiked up the narrow path and as the sky darkened, people in the valley heard him playing a sprightly tune. Apparently, the snakes came out, because the following day, a group of men found Martin Stone lying dead on Fiddler’s Rock. His back, arms, chest, and even his face, were covered by ugly purple bruises and streaks of congealed blood, the results of numerous snake bites. Stone was right about the boots though – they had protected his legs. He just hadn’t counted on the wily reptiles’ silently slithering up from behind as he perched on his favorite rock. Getting Stone off the mountain presented a problem for his friends. He had been dead a number of hours, rigor mortis had set in, and his left fist was clenched tightly around the fingerboard of his fiddle; the right was just as tightly clutching the bow. Unable to pry loose his fingers, the men placed their coats over Stone’s face and grotesquely positioned arms and transported the corpse – still gripping the bow and fiddle – down the mountain. To circumvent the curious, the men discreetly entered the undertaking parlor through the back door. Tomb of Grancer Harrison (2012). The Dancing Ghost. One of the most intriguing tales of phantom fiddlers comes from southern Alabama, where Grancer Harrison still dances to his favorite fiddle tunes near his tomb in the old Harrison Cemetery just east of Kinston. William L. Harrison was born around 1789 in South Carolina and relocated to Alabama in the 1820s with his father and other family members. The Harrisons arrived in what is now Coffee County with purebred horses, a champion herd of cattle and wagon loads of fine furniture. William immediately married a lovely girl named Nancy and constructed an impressive house on an elevation where Cripple Creek enters the Pea River. William and Nancy produced 12 children, 10 of whom lived to adulthood. As his sons reached manhood and built nearby homes of their own, they acquired the privilege of being addressed as “Sir.” This was confusing to the servants, so they began calling the Harrison sons “Sir” and William L. became “Grand Sir.” As the years passed, “Gran’ Sir,” as it was pronounced in the lazy Alabama drawl, slowly evolved into “Grancer” and for about the last 25 years of his life, William L. Harrison was known as Grancer Harrison. Death claimed Grancer Harrison one warm spring night in May 1860. Some family members were less than enthusiastic about carrying out the wishes of the dead patriarch, but the servants insisted, fearing their master would “walk” (or “dance”) if they failed to do so. Thus, Mr. Harrison was laid to rest on his feather bed, attired in his dancing duds. Another of Harrison’s instructions was that the dances continue. He had declared he would never rest in peace unless he could hear the sounds of feet tapping the hardwood floors of the dance pavilion in time to his favorite fiddle music. For a while, the Harrisons continued the barbecues and dances, but things just weren’t the same without Grancer there calling the sets and teaching everyone new steps. Attendance was sporadic at best. Finally, the events were suspended altogether and the once grand affairs faded into memory, as did Grancer himself. Shortly after the cessation of the dances, the servants began mumbling among themselves that “Ol’ Grancer” was restless and after two young boys insisted they heard the sounds of unseen feet tapping in time to the music of a fiddlin’ “haint,” no servant on the place would go near their dead master’s tomb or the dance pavilion after dark. Initially, Grancer’s survivors dismissed the servant’s tales as superstitious fantasies. Then, a neighboring farmer, passing the cemetery one Saturday night, declared he, too, heard what sounded like a party. At first, he thought the Harrisons were entertaining – but the place was dark. The reports became so numerous the family ultimately accepted the fact that Grancer, displeased by the cessation of the social events he had enjoyed so much in life, had found a way to continue his love of dancing from beyond the grave. The Harrison Cemetery very quickly became a favorite spot for young thrill-seekers but, for the most part, they were respectful. That is until one night in 1964 when someone, having heard rumors of buried treasure, dynamited the brick and mortar tomb. The following morning, feathers – and Grancer’s bones – were scattered all over the little graveyard. Though the tomb was repaired and the remains gathered and placed therein, the disturbance caused a flurry of supernatural activity with some of the most sober and serious members of the community claiming to have heard the phantom fiddler. The pavilion covering the grave, only slightly damaged in the explosion, finally rotted away. For several years thereafter, Grancer seemed to be at peace as he lay undisturbed in his splendid, rounded tomb, now warmed by the summer sun, cooled by the gentle rain and open to a canopy of stars twinkling in an ebony sky. Then, in the early 1990s, several men, or teenaged boys, entered the remote little cemetery one night and using sledgehammers, vandalized Grancer’s tomb once again. Huge chunks of stucco and brick were broken away, leaving the contents of the grave open to the elements. It was rumored the cemetery was desecrated by a group of people who considered paranormal activity demonic in nature, though nothing was ever proven. But regardless of the motives for the vandalism, it was some time before the damage was repaired. On July 30, 2010, the Harrison Cemetery – including Grancer’s resting place – was vandalized a third time with approximately 50 tombstones being overturned. Once again, someone had taken something akin to a sledgehammer and left gaping holes in the above-ground vault. The tomb has since been patched. The Harrison house, barns and other buildings are gone now and the forest has reclaimed much of the area where they once stood along the banks of the two streams. No one living today remembers the wooden dance pavilion, but they know it was located near the edge of what is now the cemetery. Nevertheless, people from far and wide visit the isolated little country graveyard, even though after more than 150 years, few hear the phantom fiddler or encounter the dancing ghost. But as recently as the late 1990s, a farmer and his son and nephew, helping a neighbor gather his peanut crop in a field near the cemetery, heard what they later described as “old-time fiddle music.” It was close to fall, rain was forecast and clouds were already partially obscuring the almost full moon. After the last of the peanuts had been harvested, the man and two boys were in the process of retrieving some equipment when the fiddling started. They immediately assumed someone was playing a trick on them. Being dead tired from toiling since sunup, the three were in no mood for jokes and decided to teach the pranksters a lesson. One of the teens grabbed a flashlight, the other a shotgun, and they all headed in the direction of the music. As they approached, the fiddling grew louder, then abruptly stopped. A shot was fired into the air to “scare off the rascals,” but there were no cries of “Don’t shoot!” or sounds of scurrying feet. While the farmer attempted to rationalize the situation to the pair of clearly frightened teens, a dark cloud enshrouded the moon, turning the night pitch black, and a sudden, chill wind made them shiver. Finally, the farmer broke the silence, “We need to get out of here before the rain starts,” he declared. “Shine that flashlight around and let’s see where we are.” And there, just a few yards away, glowing like a specter in the pale beam of light, stood the massive tomb of Grancer Harrison. References: Appalachian Ghosts by Nancy Roberts;Ghost Stories from the American South by W. K. McNeil; The Daily Cougar, Houston, Tex. ; James A. Dean (formerly of Houston), 1998 interview; Delaware City Public Library; 13 Alabama Ghosts and Jeffrey and 13 Tennessee Ghosts and Jeffrey by Kathryn Tucker Windham; F. C. Harrison, Tallahassee, Fla., 1986 interview; Jewell Harrison Johnson, 2003 email communication; and Enterprise Public Library, Enterprise, Alabama. All of these stories are great. Being from Alabama, of course I knew about the "Dancing Ghost of Grancer Harrison" and it's my favorite. My cousin went to school with one of the boys who heard the music that night in the peanut field. She said that he didn't like talking about it and that it scared him more than he ever would admit. He joined some branch of the service after he graduated from high school. The dancing ghost of Grancer Harrison is one of my favorite ghost stories. Years ago we were driving through Alabama and we made a point of stopping at the Harrison Cemetery. It was a bigger cemetery than I had thought and there were corn and peanut fields around it. We didn't see or hear anything strange, but it was a bright, sunny day. I know people who swear that they've heard the fiddle music coming from Fiddler's Rock. I've been there, but I've never heard it myself. Wasn't Lidenwald one of the Mystery Locations in the old group? I've never been to the house, but next time I'm in that area, I'm going to try to stop and see it. That part of New York is very historic and very scenic. The Dancing Ghost of Grancer Harrison has been one of my favorite ghost stories since I first read it in a library book when I was a kid. "The Dancing Ghost of Grancer Harrison" has been one of my favorite ghost stories since I read about it long ago in a book called 13 Alabama Ghosts.